Streeterville was named after George Wellington "Cap" Streeter who was a jack-of-all-trades who in 1886, purchased a boat, named it the Reutan, and took it out with his wife for a first voyage on Lake Michigan during a storm. Well, they ended up on a sandbar 450 feet east of Michigan Avenue. Instead of digging themselves out once the storm had passed, they decided to live on the sandbar on their boat. This was only 15 years after the Great Chicago Fire, the city of Chicago was in the process of rebuilding. Cap Streeter told several contractors that they could use his sandbar as a dump for a small fee, and soon the sandbar extended the shoreline by 186 acres! He found that Chicago (and Illinois) ended at the original shoreline,this meant his sandbar was not considered to be a part of either. He named it the "District of Lake Michigan" and claimed full rights to this land. At this time, Cap began selling small portions of his land and thus a shantytown was born on the sandbar. Cap built a house on the land and before long and then some of Chicago's wealthier businessmen petitioned to have Cap and the shantytown residents booted off the land, since they thought the land could be better used, as a highway connecting the Loop to the Gold Coast. After several battles over who owned the land, Cap was arrested for an unrelated, minor offense. During this time, his home was burned down and he finally lost control of the land. He died in 1921. 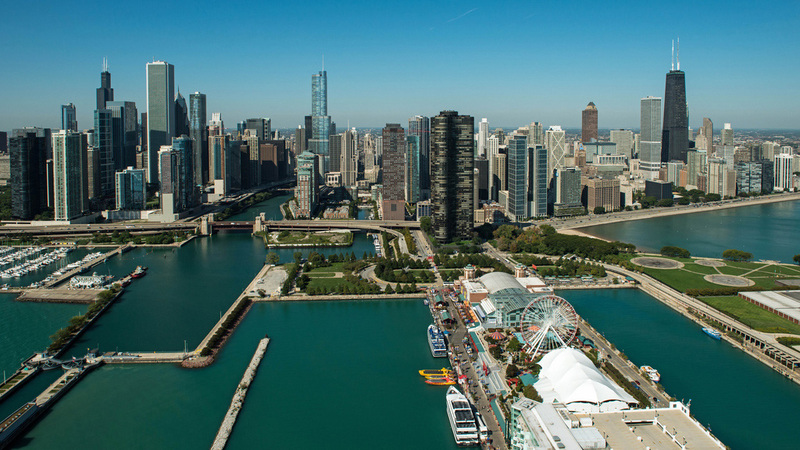 The land where the sandbar originated is now some of Chicago's most expensive real estate known as Streeterville. Mostly condos in Streeterville, many with water views of the Chicago River & River Walk, Lake Michigan, Navy Pier and parts of the Skyline. Shopping, Museums, Millenium Park, Grant Park, Navy Pier, restaurants and bars are abundant and just a walking distance away.